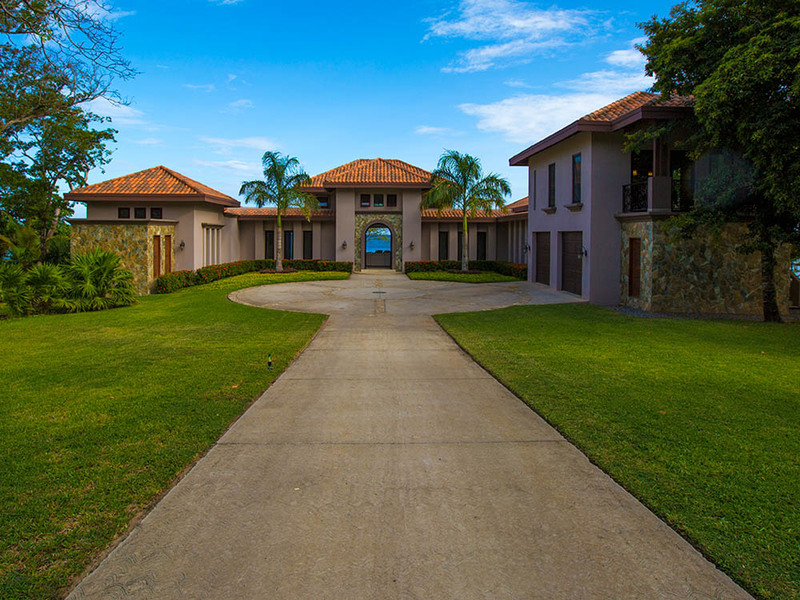 This beautiful 5BR/4BA Mediterranean style waterfront estate is located in Roatan, Honduras – the largest of the Bay Islands. 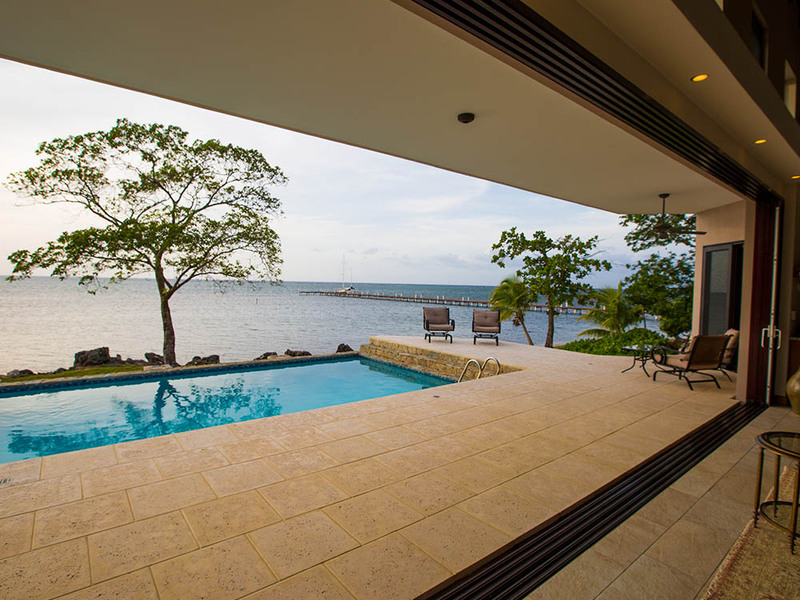 Constructed in 2014, this home was designed by one of the leading Architects in Honduras with one purpose in mind: to capture the sweeping view of the beaches and crystal -clear turquoise waters of the Caribbean Sea. 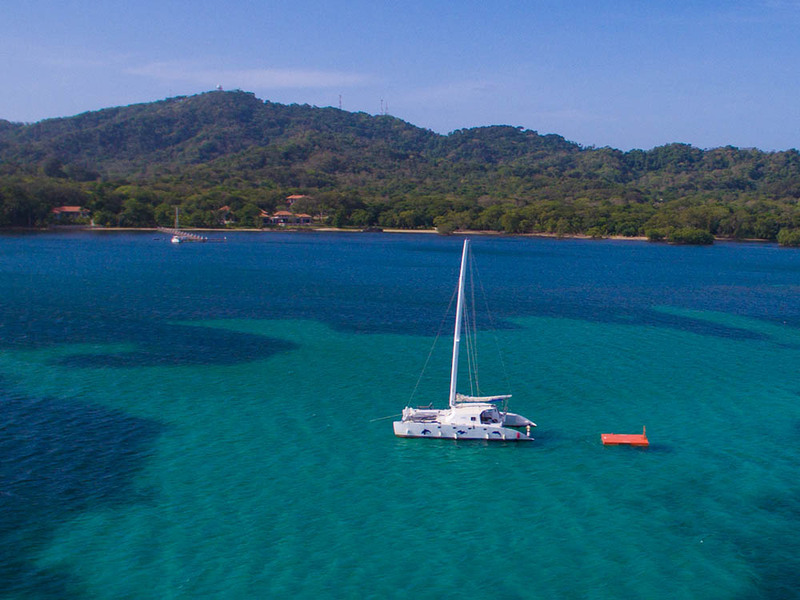 Sitting on a one-acre lot, this tropical island retreat offers privacy and seclusion. 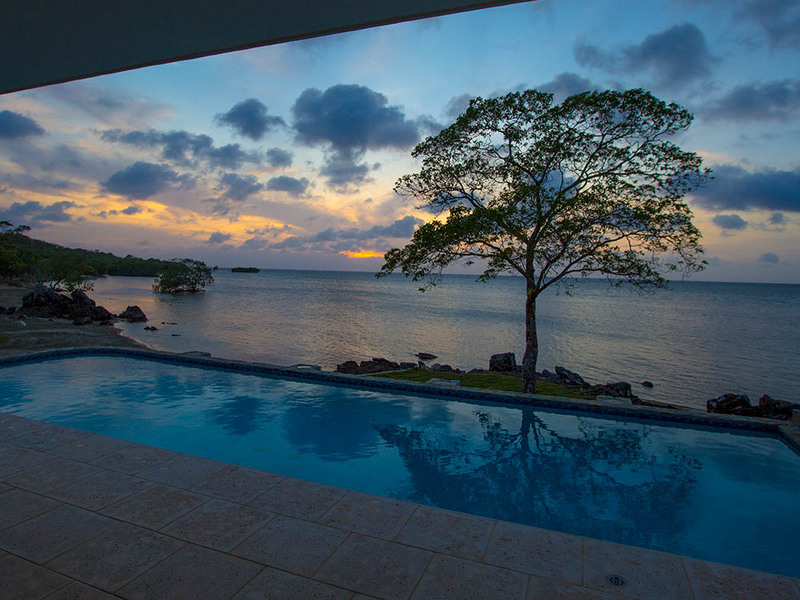 Relax on one of the home’s private terraces and enjoy the beautifully landscaped terrain or take a sunset stroll on the estate’s beach extending along 184± feet of the Caribbean coastline. An Albert Burney representative will be available daily from August 13th thru auction Day between 10:00 AM to 4:00 PM. For more information call (800) 434-1654. Shown by Appointment Only. Ten percent (10%) down Auction Day with closing on for before September 20, 2016. Certified funds in the amount of $50,000.00 will be required to bid. The certified funds may be in the form of a Cashier’s Check made payable to the bidder, or a personal or company check with a Bank Letter of Guaranty. 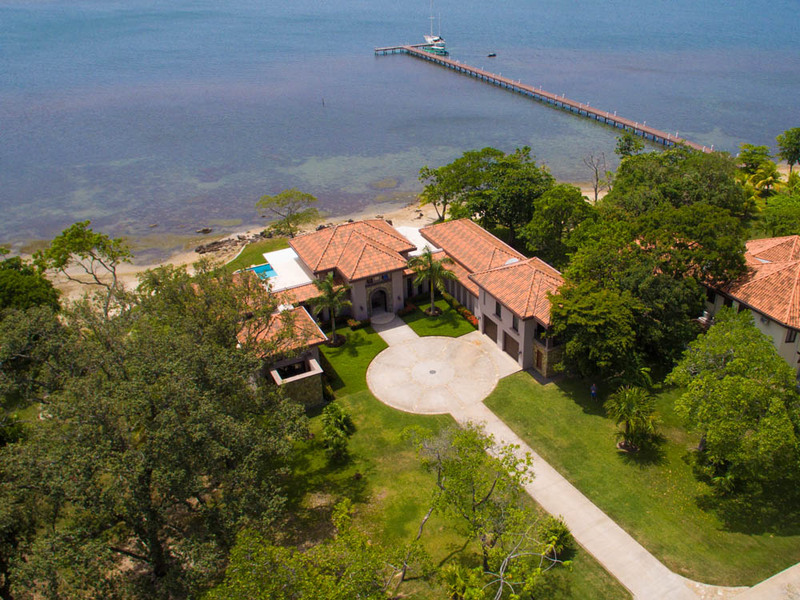 This beautiful 5BR/4BA Mediterranean style waterfront estate is located in Roatan, Honduras – the largest of the Bay Islands. 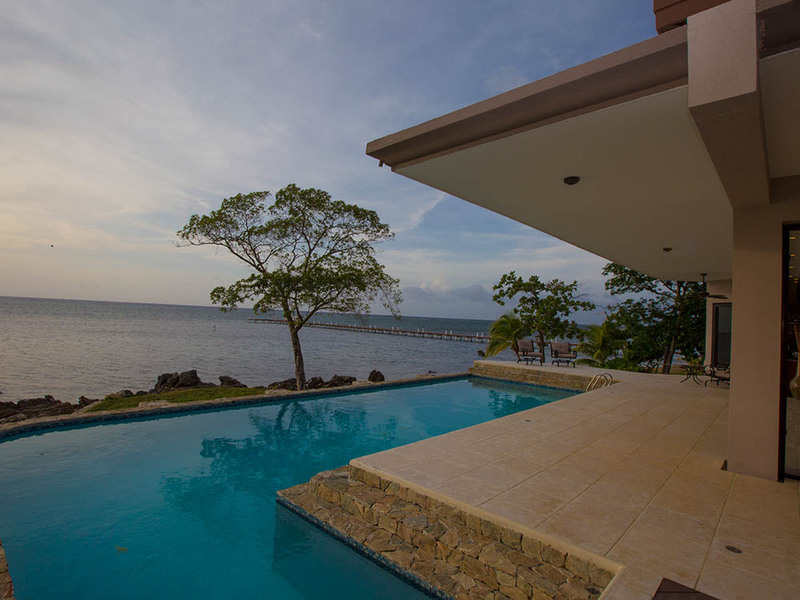 Constructed in 2014, this home was designed by one of the leading Architects in Honduras with one purpose in mind: to capture the sweeping view of the white sandy beaches and crystal -clear turquoise waters of the Caribbean Sea. Sitting on a one-acre lot, within the Blue Harbour gated community, this tropical island retreat offers privacy and seclusion. 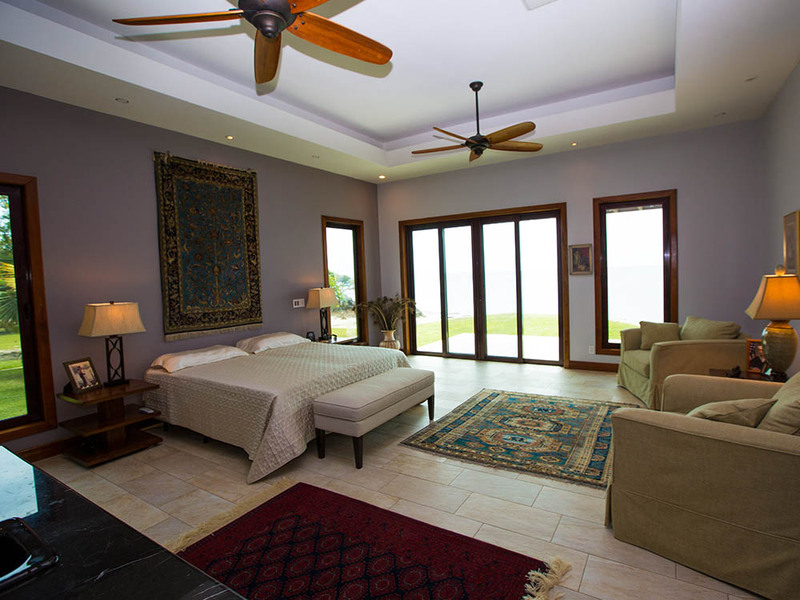 Relax on one of the home’s private terraces and enjoy the beautifully landscaped terrain or take a sunset stroll on the estate’s private beach extending along 184± feet of the Caribbean coastline. With 6,300± square feet of living space, this home is perfect as a vacation home or a family compound. The main living area of the home boasts 22± ft. high exposed-beamed ceilings and – along with the kitchen and dining area – also features disappearing glass panels offering an ocean breeze and expansive views of the Sea. 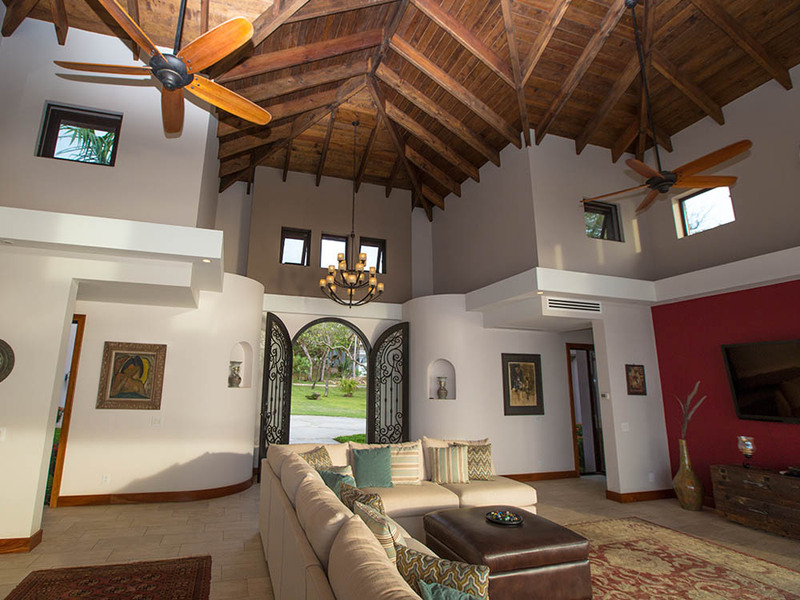 The home’s beautiful interior utilizes rich mahogany imported from Belize for arched doors, cabinets, window and baseboard trim, along with exposed beam ceilings in the living area, gourmet kitchen, master bedroom and studio apartment. Two bedrooms flank each side of the home’s living area. On one side there is a large master suite featuring 12± foot exposed-beam ceilings and double sliding glass doors that lead to a covered patio. The en-suite master bath features floor to ceiling tiles imported from Italy. It also has dual vanities, a private water closet, a spacious dual shower with black river rock floors and a large walk-in closet. This wing of the home also features an optional 5th bedroom or office space. Two additional guest rooms flank the other wing of the home, each with its own en-suite bath, featuring floor to ceiling tile. One bedroom boasts its own private patio with an ocean view. This beautiful estate also features a studio-style apartment over the 2 car garage with it’s own private entrance. The studio features exposed-beam ceilings, its own en-suite bath and a small kitchen area. Cool off in the home’s American style swimming pool overlooking the ocean. The pool deck is covered with artificial stone made to stay cool even with direct sun exposure. At night, you can create your own poolside light show with three Pentair LED variable color programmable pool lights and three Pentair laminar flow streamers with LED variable color lights. All pool functions can be controlled remotely from either a computer or I-Pad or I-Phone using Pentair ScreenLogic connect and controls. 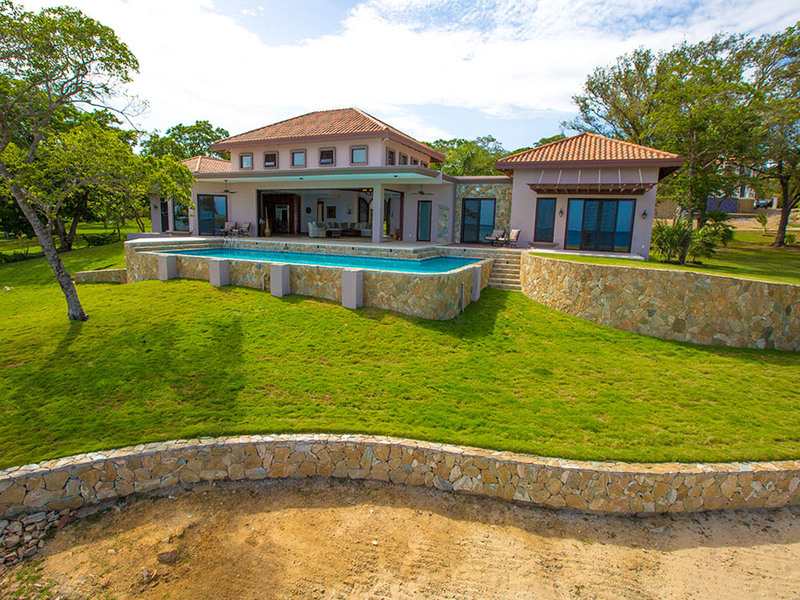 Don’t miss your opportunity to purchase this secluded gated Caribbean Estate offered at Absolute Auction – Selling Regardless of Price! Large walk-in equipment room under the pool side deck contains all of the valving and equipment for the pool. Pump is a extremely efficient programmable Pentair variable flow type for maximum cost savings. Chlorine is produced by a Pentair salt chlorinator. Filtration is accomplished using a Pentair Sand Filter with a 5 micron particle filter for use with the laminar flow devices. Deep reinforced foundations that run the length of all supporting walls, extensive use of larger Rebar in all beams and within the block walls. The floors were laid with a single pour to eliminate any insect intrusion due to normal separation of slab to wall when they are poured after the walls are up. Exposed Ceilings were constructed with larger than normal beams, rafters (3X10, 3X12 etc.) with 24″ rather than 16″. Exposed roof boards were made smooth with non-rounded corners for improved aesthetics. Custom fiberglass lined rain gutters Cistern water collection. Separate waste-water plumbing for grey water (sinks) and toilet. Three tank Septic System with aeration and bacteria with warning system. Double size cistern of 20,000 gal. Custom US water purification system with charcoal, chemical, UV and micro particle filtering. Oversize 92 gal pressure tank for potable use. Switchable water source from cistern vs community well water source supply to building, outside or both. Electrical wiring all in conduit with conduit runs corresponding to electrical circuits. US standard 12 gauge instead of 14 gauge wire for lighting and normal outlets. Major Provisions of US Electrical Codes enforced. Electrical Transient protection system installed in house to protect electronics and appliances. Generator area in garage, wired for future instillation of 220VAC generator and controls if desired. Highly efficient dimmable LED bulbs controlled by dimmers and grouped into functions by Lightolier push-button controls. Each function can be preprogrammed for up to five different lighting moods. Materials were specifically obtained from different countries in order to obtain the final design criteria. 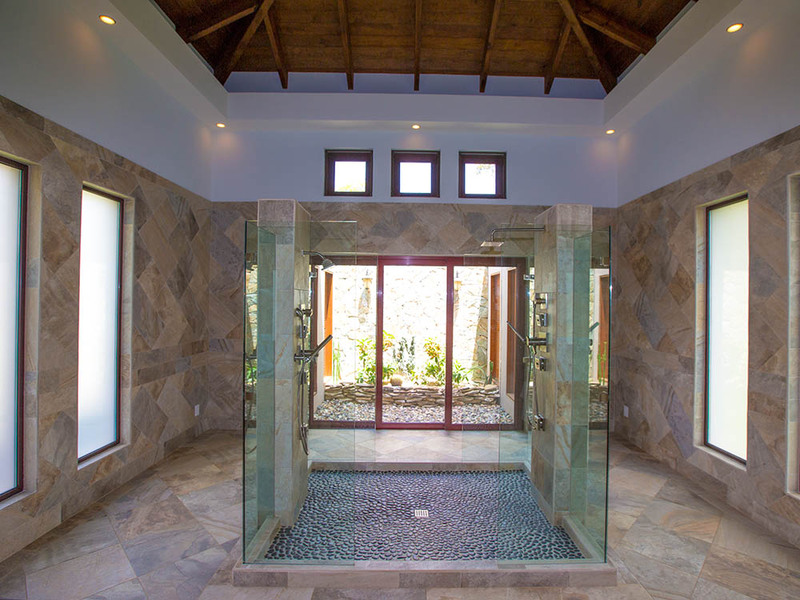 All casework (cabinets, doors, moldings) was custom designed by the owner and built by an upscale shop in Belize using Belizean Mahogany and shipped to the job site. Oversized two-car garage with remote controlled and insulated garage doors. A 20,000 gallon cistern underneath. Within the garage area is the Equipment and Generator rooms. All Appliances were purchased directly in the US. All tiles (except Pool tiles) were selected and purchased by the owner and shipped from Italy directly to the job site. Local tile layers were taught how to do wrap around tile cutting while maintaining matching grout lines. All lighting fixtures, fans, electrical material’s hand-selected in Miami and shipped to the Job Site. Kohler porcelain fixtures were selected as they are rated the best. Delta faucets with ceramic valves stand up under the local hard water conditions better than others. All hand selected and shipped to the Job Site. For reliability and longevity Mitsubishi Multi Vane Air Conditioners were selected based on load requirements determined by AC Engineers in the US. Roof over the pool deck and two bedroom deck pergolas were self-suspended to enhance the view without obstructions. DISCLAIMER: All information is taken from sources believed reliable; however, no guarantee is made by the Auction Company, Broker, or Seller. Buyers should satisfy themselves as to any inspections prior to bidding. Any announcements made the day of the auction supersede all advertising. All measurements, boundaries, & square footage have been received by 3rd party resources.